To make the lime dressing, place the green onion, coriander, lime juice, sugar, salt and pepper in a small bowl and whisk well to combine. Set aside. Place a large saucepan half-filled with water over high heat and bring to the boil. Line a large (or 2 small) steamer with non-stick baking paper. Place the sweet potato in the steamer, top with the cod and cover with a tight-fitting lid. 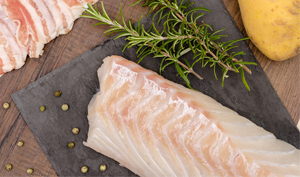 Place the steamer on top of the saucepan and steam for 5-6 minutes or until the cod id cooked through. Spoon over the lime dressing to serve.